In a terribly poor attempt to appeal to younger audiences, Europol thought the best way to promote active civic engagement on the internet is by using a language all the cool kids these days can speak: Emoji. 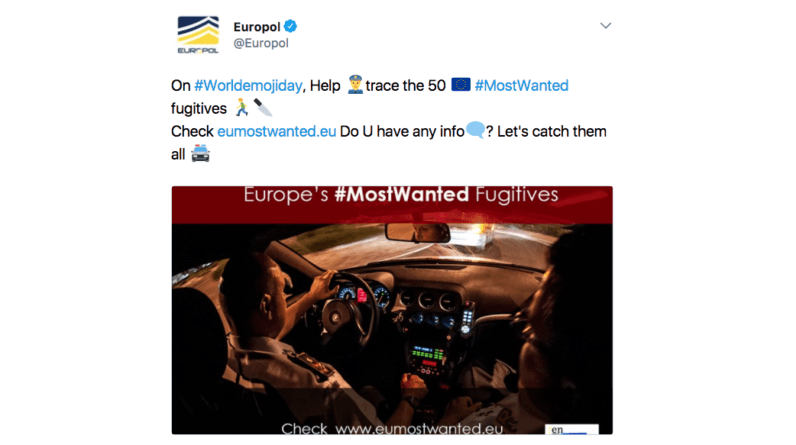 To commemorate the fourth annual World Emoji Day, the European law enforcement agency took to Twitter to ask its followers for help tracking down the most wanted fugitives on the continent. But while a few simple words would have sufficed, Europol opted for an alternative means of expression. In fact, Europol was not alone in its desperate efforts to leverage World Emoji Day into attracting new followers. In all fairness, Europol and the Metropolitan Police hardly the only one to have fallen for the ‘cool and hip’ approach. Google similarly tried playing it cool with the youngsters when it released a self-commissioned research – ridiculously titled It’s Lit: A guide to what teens think is cool – into what brands teenagers relate to the most. Both attempts were wildly mocked in the end. But it seems neither Europol nor the Metropolitan Police got the memo. Down with the rest of the cool kids? Tell us what you think about Europol’s hip tweets in three emoji or less – just like Hillary Clinton would’ve wanted you to.